Designed to Perform - With innovative features like a patented air charge tube (WATCH VIDEO) that adds air in all the right places while keeping the coal bed from falling through, to the patent-pending vertical heat exchanger that optimizes heat transfer, the Classic Edge is the perfect combination of performance and value. 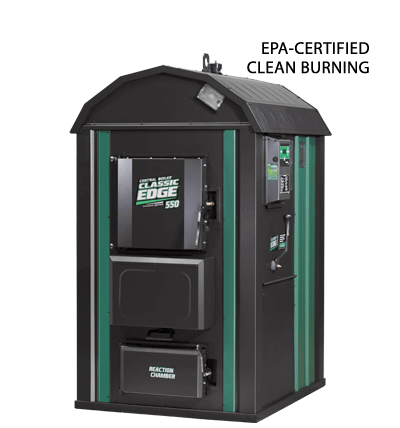 Easy to Operate - With Central Boiler's FireStar II electronic controller optimizing the gasification process, the Classic Edge is one of the easiest ways to heat with wood. Higher Efficiency - Fire burns down through the Fusion Combustor where extremely high temperatures aid in complete combustion, resulting in high efficiency and extremely low emissions. Less Maintenance - Vertical heat exchanger (WATCH VIDEO) optimizes heat transfer and requires little maintenance. Heat exchanger includes integrated cleaning system and, if needed, a removable access plate, a Classic Edge exclusive. 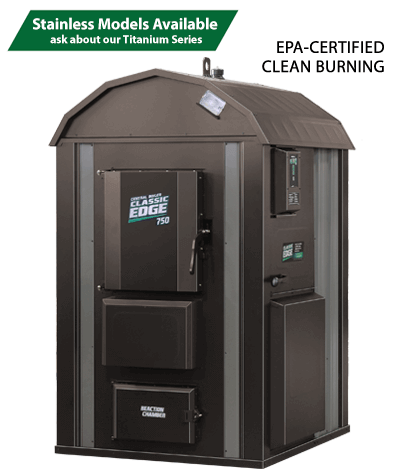 Burns Less Wood - A hallmark of Central Boiler furnaces for over 30 years, spray-on urethane foam (WATCH VIDEO) is the ultimate airtight, waterproof insulation that locks the heat in to reduce wood usage, even at the coldest temperatures. Water Capacity - 150 gal. **Based on EPA qualifying test. Is this furnace right for my application? Stainless steel firebox - Constructed of titanium-enhanced stainless steel, the firebox has superior corrosion resistance and excellent heat transfer performance. This allows loading the firebox for longer burn times (in some cases up to 48 hours or more*) and burning some wood that is less than perfectly seasoned. *Central Boiler recommends burning seasoned wood when possible because dry wood burns better and provides more energy for heating your home. You'll burn less wood, saving you more money and time. That is, after all, what you want your outdoor furnace to do. Actual burn times vary based on wood types, moisture content, heat load and ambient temperature. FireStar Combustion Controller with Integrated Wi-Fi - The FireStar combustion controller monitors all functions of the furnace and optimizes the gasification process automatically. 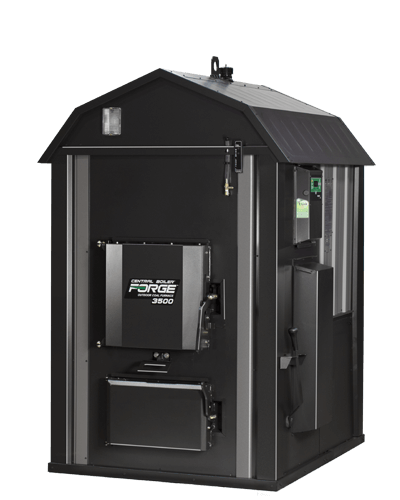 Working much like a car's engine control unit (ECU), the FireStar optimizes furnace performance by using sensors to decide how to control and independently adjust the primary and/or secondary air for a cleaner and more efficient burn. It can even shut the fan off to preserve heat if it runs out of wood. The FireStar features integrated wi-fi so you can monitor your furnace from anywhere with no additional hardware except a router and internet access. Easy View™ Heat Exchanger - The patent-pending vertical Easy View™ Heat Exchanger is an industry exclusive. Featuring a removable rear panel that provides full access without the use of tools, it's easy to access for quick inspections and even easier to maintain if cleaning is necessary. Steppers Motors - Low voltage, zero-maintenance stepper motors replace solenoids. They have a simple design, are more robust and never need adjustment due to wear. NOTE: Adding the proper water treatment BEFORE adding water to the system is critical for a Titanium Series furnace. The Owner's Manual and Warranty will outline the needed requirements. 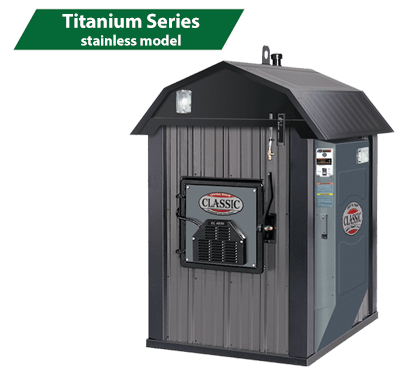 Ask us about more information about Titanium Series models. Water Capacity - 205 gal. Bypass Door - Allows you to redirect the exhaust before opening the firebox door. Water Capacity - 330 gal. 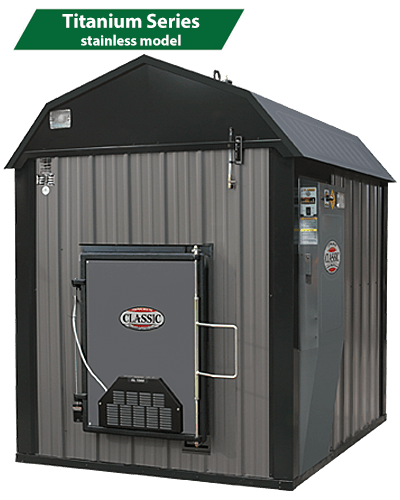 Ultimate Control - The FireStar II Electronic Controller automatically adjusts the primary and secondary air which optimizes the gasification process. 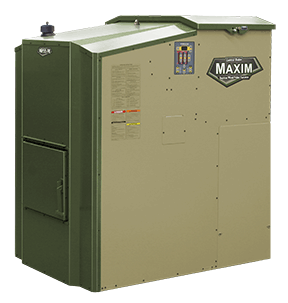 This allows the furnace to be more efficient and cleaner burning. Provides user with easy operation of the furnace with just the touch of a button. Less Maintenance - The Xtract® heat exchanger allows you to get the most heat out of your wood. The vertical design minimizes the amount of maintenance. Burns Less Wood - Urethane foam insulation gives you the best energy savings, even when the conditions outside are at their worst. This airtight, waterproof seal around the water jacket makes your wood pile last longer. Performance - Patented air charge tube adds air in all the right places to aid in the combustion process and keeps the coal bed from falling through. High Efficiency - Final combustion takes places as the gases move downward through the Fusion Combustor to the Reaction Chamber. There, extremely high temperatures aid in complete combustion, resulting in high efficiency and extremely low emissions. Operational Convenience - Bypass Door allows you to redirect the exhaust before opening the firebox door. The Bypass Door Alarm reminds you to close the bypass door after you have closed the firebox door for efficient operation of your furnace. Easy Loading - The triple-insulated firebox door is just the right height and features a large opening for easy loading. The Cam Loc door closure secures the door at all fource corners and provides a tight seal. LED Lights - The long-lasting, energy-efficient LED night lights save money and enhance safety. The illuminate the inside of the firebox and the front and sides of the furnace. Can be set to automatically turn on at night. Easy Ignition Option - The optional gas-fired wood ignition takes the work and worry out of lighting a fire with just the touch of a button. 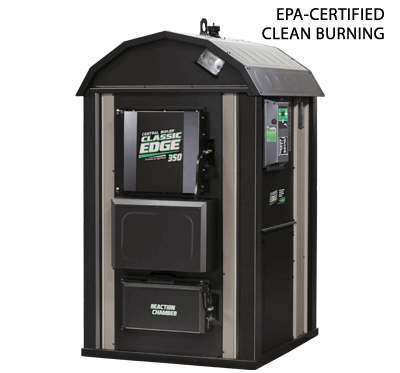 U.S. EPA Certified - The E-Classic 1450 is U.S. EPA Certified. Water Capacity - 200 gal. *Based on EPA qualifying test. Easy Loading - The triple-insulated firebox door is just the right height and features a large opening for easy loading. The Cam Loc door closure secures the door at all four corners and provides a tight seal. 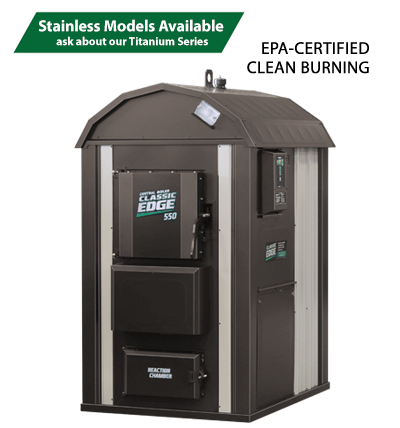 U.S. EPA Certified - The E-Classic 3250 is U.S. EPA Certified. Water Capacity - 410 gal. 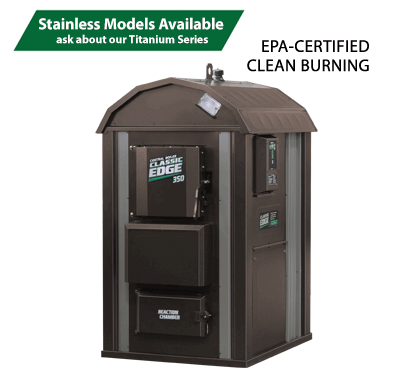 Titanium Series stainless models offer the same great features and benefits of non-stainless models with added benefit of a stainless steel firebox assembly. Adding the proper water treatment BEFORE adding water to the system is critical for a Titanium Series furnace. The Owner's Manual and Warranty will outline the needed requirements. 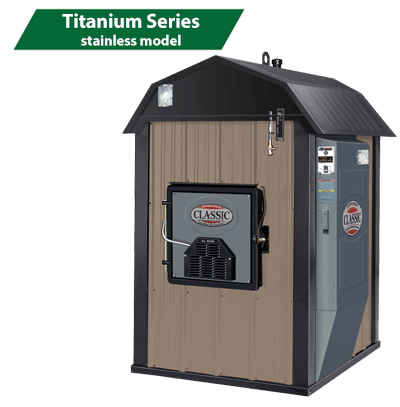 Ask us about more information about Titanium Series models. In the U.S., this appliance is for non-residential applications only. Simple Installation - The skid base framework makes installation easy with or without a cement foundation. 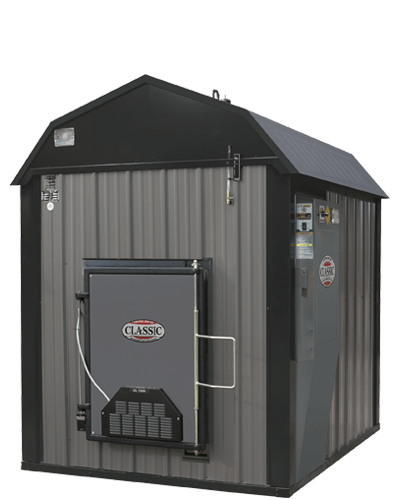 Only the CL 7260 and Pallet Burner models require a slab foundation. 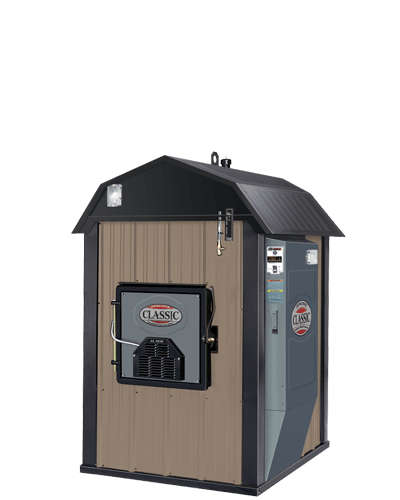 Simply set the furnace in place, connect the piping and heat exchangers to your existing heating system, and the Classic is ready to go to work. 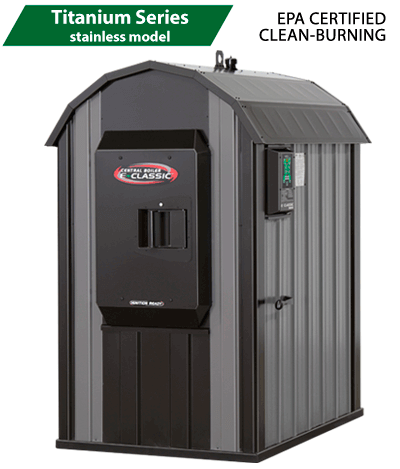 Easy Loading - Loading wood is easy with the large insulated cast-iron firebox door. Ergonomically designed, the door is easy to open and close, and locks in the heat. Convenient Operation - The automatic draft control in the firebox door controls how the fire burns based on settings you select on the digital temperature controller. 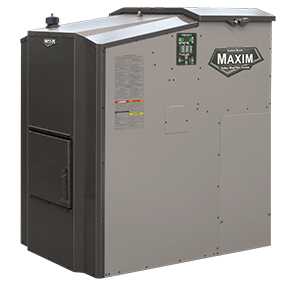 Burn Less Wood - A hallmark of Central Boiler furnaces for over 30 years, spray-on urethane is the ultimate airtight, waterproof insulation that locks the heat in to reduce wood usage, even at temperatures of -35°F or colder. Efficient Operation - The RippleTop® and HeatLock Baffle® increase the heat transfer area in the firebox and trap the heat and gases in the top of the firebox for the most complete combustion and heat extraction. The high-capacity water jacket provides a proven balance between firebox volume and water capacity for optimum performance and safety. 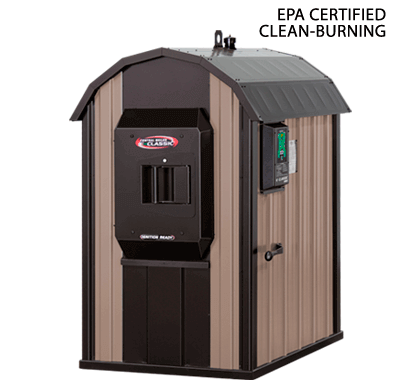 Easy Inspection and Maintenance - Large firebox doors and an angled firebox base make ash removal easy and fast. The rear-exiting design of the chimney eliminates leaks and corrosion that through-the-roof designs can experience. 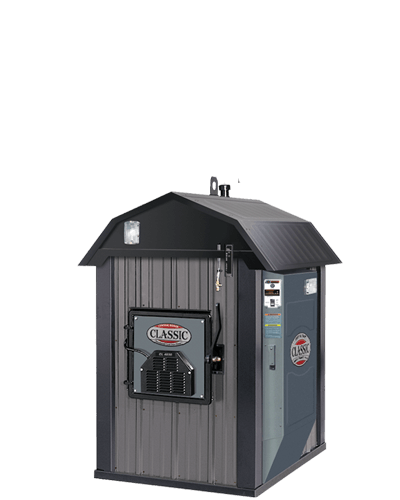 The Classic's chimney is designed for easy inspection and reduces heat loss by over 50%. 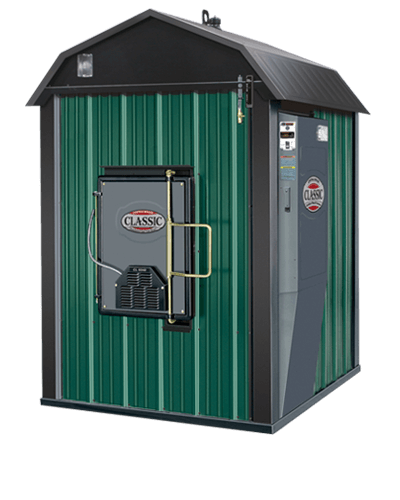 Durability and Reliability - Classic furnaces are manufactured with attention to detail. From a rectangular firebox that won't collapse like round fireboxes can, to overlapped steel siding, photo electric controlled night light and high-quality coated fasteners, every component must meet the highest standards...ours. Water Capacity - 140 gal. Water Capacity - 196 gal. Water Capacity - 393 gal. Water Capacity - 764 gal. Heat Multiple Buildings - Heating multiple buildings is easy. The Forge 1500 has one set of 1-1/4" supply and return ports (that can be configured for two pumps). 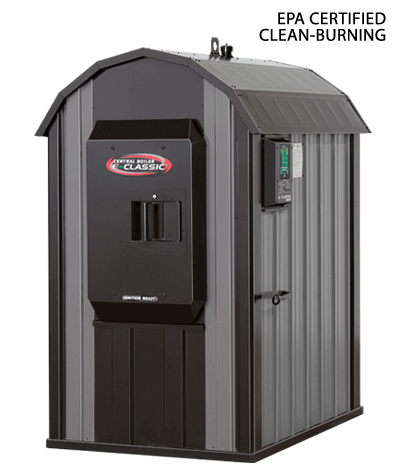 Convenient Operation - Loading coal is easy with the large firebox door. Ergonomically designed, the firebox door is insulated and easy to open and close. Heavy-duty shaker grate, conveniently operated by handle on side of the furnace, allows ash to fall below into the ash collection area. Ash removal is easy. 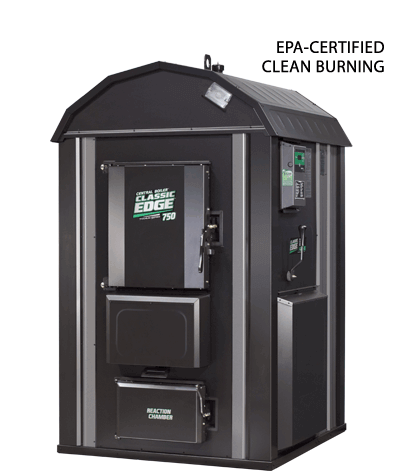 Burn Less Coal - A hallmark of Central Boiler furnaces for over 30 years, spray-on urethane is the ultimate airtight, waterproof insulation that locks the heat in to reduce coal usage, even at temperatures of -35°F or colder. It provides 2-3 times the effective R-value of conventional fiberglass batt insulation. Ultimate Control - The FireStar® combustion controller monitors all functions of the furnace and can store and share operational data. The controller's technology optimizes the combustion process by automatically adjusting the fan-forced air for a cleaner and more efficient burn. The controller's integrated wi-fi allows you to connect to your local wi-fi network and take advantage of the online features when you create an online account (see dealer for details). 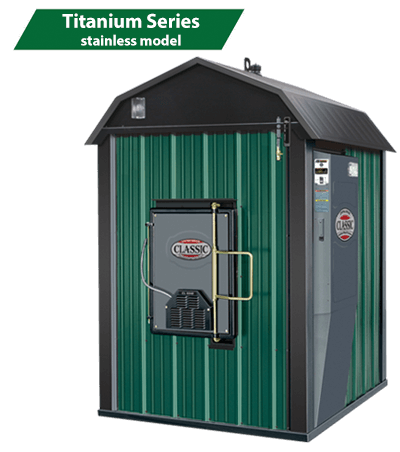 Firebox - 40" x 30" x 26"
Grate Size - 6" x 16-7/8"
Heat Multiple Buildings - Heating multiple buildings is easy. The Forge 3500 has one set of 1-1/4" supply and return ports and one set of 3/4" supply and return ports. Water Capacity - 210 gal. 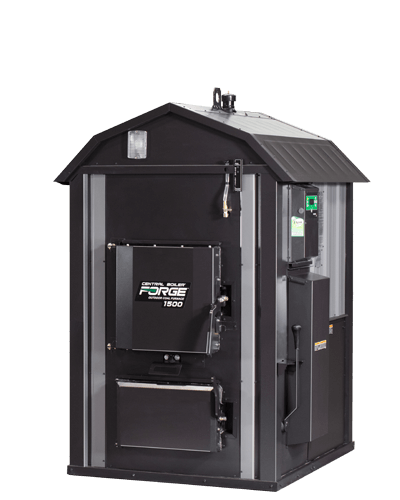 © 2019 BEAVERTON OUTDOOR WOOD FURNACE. All Rights Reserved.